where T is the orbital period, * marks multiplication, R is the orbit's radius in units of Earth radii (= 6371 km) and √R is the square root of R.
(more accurately, the orbital period is 235.9 seconds short of 24 hours, equal to the Earth's true rotation period). Such an orbit is ideal for a communication satellite, for then a "satellite dish" linked to it need not track it across the sky, but can stay pointed in a fixed direction. It was the British science fiction writer Arthur Clarke who first proposed the use of this "synchronous" orbit, long before the first artificial satellites. Clarke later wrote the book "Fountains of Paradise" (set in Sri Lanka, to which he had moved) in which thin cables linked synchronous satellites to the ground. A material strong enough and light enough for such cables does not exist, and is so far beyond anything known that it is probably impossible; but it makes a good story. As of 2006, about 200 satellites inhabit the synchronous orbit, some owned by governments for their own use, many operated by telecommunication companies. The Kepler formula also applies to elliptical motion, provided R is replaced by the semi-major axis a of the orbit. Over time however orbits stray from exact Keplerian ellipses because to additional forces, such as the attraction of the Moon and the Sun. For elongated ellipses, this causes the lowest point in the orbit ("perigee") to move up and down, ultimately reaching the atmosphere and causing satellite to be lost. Atmospheric friction also causes low-altitude satellites to re-enter, sooner or later: all these, as they lose energy, descend deeper and deeper into the atmosphere, and ultimately reach denser regions, where they burn up. That was the fate of the Skylab space station in July 1979: NASA had hoped to use the Space Shuttle to boost it into a higher orbit, but the shuttle was not ready on time. Instead, the peak of the 11-year sunspot cycle arrived, a more active peak than NASA had hoped for, bringing a greater intensity of solar x-rays and extreme ultra-violet radiation. Such radiations are absorbed in the uppermost fringes of the atmosphere, heat them up and make them expand outwards, more at "sunspot maximum" than at other times. Their expansion increased the air resistance ("drag") to the motion of Skylab and caused its early reentry. If the Earth were a perfect sphere, orbit calculations could assume that all its mass was concentrated at its center: the force, at least outside the Earth, would have been exactly the same. However, the centrifugal force associated with the Earth's rotation makes it slightly non-spherical, wider across the equator by a few kilometers than from pole to pole. That modifies the orbits of satellites and must be taken into account. When the orbital plane is inclined to the equator, the equatorial bulge slowly rotates it around the Earth and a line perpendicular to the orbit plane gradually traces a cone. Interestingly, there exists a situation where one can take advantage of this rotation. Ordinarily, a satellite's orbit is fixed in space, and as the Earth goes around the Sun, its orientation relative to the Sun constantly changes. Take for example the case of a low altitude satellite whose orbit plane contains the axis of the Earth (i.e. a polar satellite, whose orbit passes right above the north and south poles). If in June that plane happens to be lined up with the dawn-dusk direction, i. e. the division between the sunny side of Earth from the shaded one, then in September it matches the noon-midnight direction, a rotation of 90 degrees. Note that the June orbit enjoys 24-hour sunlight, but the September orbit does not. However certain orbits exist, passing just a few degrees from the poles, whose planes are rotated by the bulge of the Earth by exactly one rotation per year. Such "sun synchronous" orbits, can be made to always face the Sun, or always go through midnight. 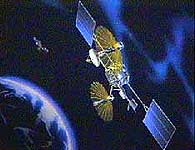 The DMSP satellites have such orbits (the picture here, of the aurora above the Great Lakes, was taken by one of these satellites; note Florida at bottom right), and so did Magsat. Earth observation satellites such as Landsat and SPOT (Satellite Pour l'Observation de la Terre) also prefer sun-synchronous orbits, which ensure that images from different dates are always taken at the same time of the day. Without this, the difference in the shadows may confuse their interpretation. By Kepler's 3rd law, a spacecraft going around the Sun in a circle smaller than the Earth's orbit will always have a shorter period and will move faster, and if launched from Earth its distance will grow until it and the Earth are well separated. Yet a way exists for keeping the two together. If the spacecraft is placed between the Earth and the Sun, the opposing pull of the Earth reduces the effective pull of the Sun, allowing the spacecraft to orbit the Sun more slowly. If the distance is properly chosen, the orbital motion will match that of Earth, allowing the two to stay together throughout the Earth's annual journey around the Sun. The point where this happens is the L1 Lagrangian point (after Joseph Lagrange, the Italian-French mathematician who pointed it out). It is about 4 times more distant than the Moon, at about 1/100 of the distance of the Sun. The next section gives a calculation of the L1 distance, using results from sections (20),(21) and (M-5). The L1 point provides a very useful position for monitoring the solar wind before it reaches Earth and for other purposes. Currently two spacecraft are stationed near L1-- ACE, studying "anomalous cosmic rays" and also observing the solar wind, and SOHO, which observes the sun. WIND which also occupied this region has moved to a new orbit. SOHO, a joint effort by NASA and the European space agency ESA, was nearly lost in June 1998 when by accident its high-gain antenna was shifted to where it no longer pointed at Earth. It also lost power because its solar cells no longer squarely faced the Sun, and the fuel of its on-board rocket got badly chilled. Some anxious months followed, during which the controllers tried various ways of re-asserting control, even using the giant Arecibo radio telescope as a radar dish to pin-point the location of the spacecraft. Control was regained in the second half of September 1998 and the spacecraft resumed operation; unfortunately, its last gyro failed in December 1998. As of April 1999, its attitude is successfully controlled by inertia wheels, adapted for a job for which they were not originally intended. Four more Lagrangian points exist in the Earth-Sun system, including L2, symmetric to L1 on the nightside of the Earth. On June 30, 2001 NASA launched its Wilkinson Microwave Anisotropy Probe (WMAP) towards the L2 point. WMAP was a follow-up on the successful Cosmic Background Explorer (COBE) which in 1992 carefully measured the brightness and wavelength distribution of the "cosmic background" microwave radiation left over from the "big bang", when the existence of the universe began (read Stephen Hawking's "A Brief History of Time" or Steve Weinberg "The First Three Minutes"). The radiation COBE observed was almost equally bright in all directions ("isotropic"), but not completely so: a small unevenness ("anisotropy") remained, and WMAP was designed to observe it better. That unevenness may be a clue to uneven distribution of matter soon after the big bang, when the volume of the universe was still small and those microwave started out as high-energy gamma rays. Their uneven distribution may be related to the observed fact that matter in today's universe seems to be clumped in distinct galaxies, with big voids between them. NASA also plans to place its "James Webb Space Telescope" (NGST), the successor to the orbiting Hubble telescope, at or near L2. For more details about these points and on related space missions, click here. The L3 point is on the far side of the Sun, invisible from Earth, unstable and probably unimportant. Of greater interest are the L4 and L5 points, on the Earth's orbit but 60° off the Sun-Earth line (viewed from above the north pole, L5 is 60° clockwise from that line, L4 60° counterclockwise). The mathematical proof that objects at these locations can orbit the Sun with the same period as the Earth while maintaining a fixed angle to the Sun-Earth line is quite long. If you are familiar with algebra and trig and have the patience for a long calculation, you may find the derivation in section #34b of this web site. If other planets did not interfere, these would be stable positions for small third bodies keeping a fixed station relative to Earth, and bodies close to such orbits would remain close to them. Claims exist of small asteroids observed near the L4 and/or L5 points of Earth, Mars and Venus (Earth so far has one), but the effect is most pronounced at the Lagrangian points of Jupiter, the heavyweight among planets. It has been claimed that several thousands of so-called Trojan Asteroids are located in the vicinity of Jupiter's L4 and L5 points, orbiting the Sun with the same period as Jupiter. They are known as "Trojans" because their names come from characters in Homer's Iliad. The Earth-Moon system also has its Lagrangian points, and the L4 and L5 points on the Moon's orbit have been proposed as sites for self-contained "space colonies." To escape Earth a spacecraft needs a high velocity: 8 km/s to enter low Earth orbit, 11.2 km/s to escape Earth altogether. The only known way of getting such velocities are rockets. But even when a spacecraft escapes from Earth, it is still held by the Sun's gravity. While no longer bound to Earth, it will still orbit the Sun, at about the same distance as before. To move around the solar system, additional velocity is needed. The hardest object to reach would be the Sun itself. Our imaginary spacecraft, freed from the Earth, would be moving like the Earth around the Sun at about 30 km/sec. The only way for it to reach the Sun is to somehow kill that velocity--for instance, by a rocket imparting 30 km/s in the opposite direction; if that were done, the spacecraft would be pulled in by the Sun. The people who propose sending nuclear waste by rocket into the Sun do not seem to know much about orbits! Considering the great difficulty in giving a spacecraft even the 8 km/s required for a low Earth orbit, the great rocket power required for reaching distant planets is a serious obstacle. Luckily, one can often take advantage of planetary gravity-assist maneuvers, as discussed in the next regular section. Questions from Users: Why is it so hard to reach the Sun? also answers: What is a sun-synchronous orbit? Why are satellites launched from near the equator?